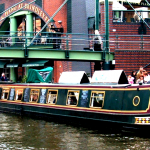 We run regular daily and weekly trips, as well as themed cruises. Choose from a range of beverages, light-bites and meals or just have some ice cream or gateau! Our famous Search for Santa trips on the canals on our quest to find Santa Claus.